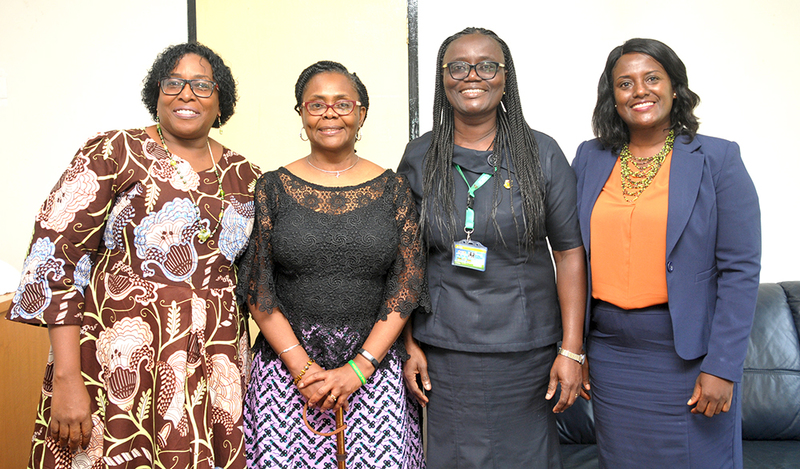 The Founder of the Feet of Grace Foundation, Dr. Irene T. Olumese, has visited the office of the Vice-Chancellor and was hosted by Professor Mrs. Rita Akosua Dickson, the Pro Vice-Chancellor. Dr. Irene Olumese was accompanied by Reverend Dr. Joy Bruce of the Lighthouse Chapel International, Kumasi. Briefing Professor Mrs. Dickson on her visit, the former employee of the United Nations Children’s Fund (UNICEF), a nutritionist and the Founder of the Feet of Grace Foundation, gave a background to her personal life as well as her mission to the University. Dr. Mrs. Olumese recounted that in April 2013, she underwent a surgery to replace her diseased lungs after twenty years of living with chronic respiratory diseases (Bronchiectasis) and a debilitating neuro-muscular disease (Myasthenia Gravis). In May, 2013, she had another surgery and her two legs were amputated below the knees. At the age of 46 years, she was faced with the challenge of living life as an amputee. She continued that within one year after the amputation and following extensive rehabilitation with the support of her family, friends, doctors and physiotherapists, she started living life to the full again. According to Dr. Olumese, the Feet of Grace Foundation officially started operation in 2015 after her amputation. She noted that this was the period she was compelled to sit down without being able to stand or walk. She hinted that this situation, gave her an insight into the plight of those who are compelled to sit down on a long-term because of their inability to access funds for prosthetic limbs. She said being able to walk again made a huge difference to her and made her to regain her autonomy and pursued her dreams, which ignited in her the desire to do the same for others. She is therefore using her life’s story and experiences to teach people around the world what the GRACE of God really means. In this light, she and her friends, mobilise support through an annual event dubbed the “Annual Feet of Grace Foundation Charity Walk”, which gives the Foundation the opportunity to raise funds to provide prosthetic limbs and wheelchairs for amputees who would never be able to afford this opportunity. She noted that she has been able to support about 25 amputees in Nigeria and hope to increase her support to 42 more amputees this year. Together with Rev. Dr Joy Bruce, they plan to organise a similar event in Ghana this year in partnership with students of the Lighthouse Chapel of the Kwame Nkrumah University of Science and Technology (KNUST) and thought it befitting to seek the permission from management of the University. She revealed that about $40,000 is needed to support at least ten (10) amputees in Ghana. She further stated that she will also do advocacy as part of the event. Dr. Olumese indicated that everyone can live beyond amputation and missing limbs should not be a limitation. According to her supporting the physically challenged is not enough but providing an enabling environment is more important. Professor Mrs. Rita Dickson welcomed the delegation on behalf of the Vice-Chancellor. She stated that KNUST has over 40,000 students and has over the years ensured that people with physical challenges have a congenial environment for their wellbeing. Prof. Mrs. Dickson further stated that with the University’s Disability Policy, efforts are continuously being made to make facilities especially buildings more accessible. However, she noted that the old buildings may not have been accessible to people with Disabilities (PWD’S) but the current Vice-Chancellor as a visionary has ensured that the new ones are accessible to PWD’s. She was happy that Dr. Olumese is supporting people who cannot afford prosthetic limbs as well as inspiring people not to lose hope. She welcomed the campaign and said it is laudable in the recent spate of suicide cases among the youth.” This message is timely that no matter what life throws at you, you can excel” she added. Prof. Mrs. Dickson pledged management’s support to her outfit and stated that the University is in support of her partnership with the students.